We purchased Veeam and got the Veeam Reporter. So far I'm not impressed with the base reports. They are an eyesore to read. I like vcheck, which is free http://www.virtu-al.net/featured-scripts/vcheck/. It's easier to read than trying to read Veeam Reporter with PDF, excel, or html. Maybe Veeam should take some notes on how to make a report easy to read. Hopefully I'm missing something with Veeam Reporter and someone can help me out. We are running the latest version of Veeam Reporter, Monitor, Business View, Enterprise manager, and Backup & Replication. I love the backup & Replication and the Monitor, but I'm disappointed in the Reporter so far. I would also like to hear of some example reports that companies are currently using for daily, weekly, and monthly reports. I'm trying to evaluate the veeam suite but reporter is not working for me, not looking good so far. As it appears to me to be using MS SQL reporter My guess is that it's what SQL report services gives. I think you can customise the layout but I have not played with it to that extent. Are you using SQL Reporting Service 2008? I also noticed that I had to enable AWE on the SQL DB server hosting the Database. Thank you for your feedback! We are going to launch a Report of the week compaign to help you in understanding the most commonly used reports. Actually, SQL Reporting Service 2008 is one of the requirements for Reporter 4 installation, so I believe Nathan should be running this very version, but thank you for your advice. sunshineknox wrote: It's easier to read than trying to read Veeam Reporter with PDF, excel, or html. Yes, you may be looking in wrong direction here. Those prefined reports are only left in the product for compatibility after merging desktop and enterprise editions of Reporter together... we are actually planning to completely get rid from most of them in the next release. The only cool stuff there is Visio reports, this is really useful. Other reports can be useful too, however, 90% of Reporter power lies in report packs other than basic (VMR) reports. I am talking about SSRS reports - this is where you can get most value from. It may not be obvious, but those Infrastructure SSRS report template provides super extensive reporting capabilities on creating reports for every aspect of your environment - something not possible with scripts. Of course, if you do not have any pains that need solving (not sure what environment size are we talking), then it is hard to put this in use. But for large environments with dozens of hosts, you will almost certainly have reporting pains which this report can easily address. 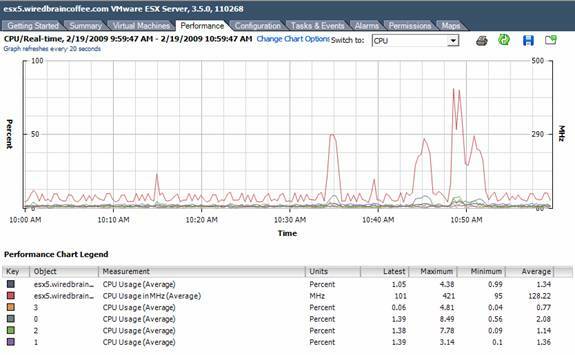 Change Management is also great if you have a few VMware admins, it helps you keep track of configuration changes. May be useful even in single-admin shop (we all make mistakes). Storage Capacity and Capacity Planning templates enables you for creating numerour super useful reports - albeit useful for larger environments mostly. Obviously if there are just a few hosts and datastores, you will have generally good idea about your capacity levels anyway. As Vitaly mentioned, we are planning for Report of The Week campaign to help our users uncover Reporter 4.0 potential, so hopefully this should help. We have been using Veeam reporter in are organization for almost a year now. for the most part it does a ok job for storage reports and infrastructure changes. However the Preformance reports can be improved. For Example when my Manager ask's for monthly metrics on are VM hosts he usually wants CPU and Memory usage. (Max, Min and AVG). I can easily get this from the VI client but I can not get this so easily from the Veeam Reports. The Veeams Reports does a nice layout but I have to do manual typing in excel to get my numbers. All the data is in the charts, why cannot veem extract this information. Also veeam should have some sort of feedback program. it would benifit them greatly. Much appreciated for your usage examples and the feedback. Actually, we do have a feedback program - our community forums is just this place. Do you have anything else you would like to share with us? Any reports feedback, feature requests? end user to select just the VM's he wants in his report. -Under Reporting Jobs in the configuration Tab. ADmins sometimes like to get Monthley reports, you only have an option to run hourly reports or daily reports. it would be nice to see and option to have this run on a monthly level or both. Jesse, much appreciated for that. Please see my comments below. king202 wrote: Depending on the report that you run (CPU, Memory, Network) there should be another column that list's Maxium usage, Minimum usage and the average usage. Could you please clarify if you would like to see the highest spike for month or week in this report? What time period do you usually use? I am asking this because all past performance data is aggregated before it gets into the database, so right now you are already getting a somewhat average number. But thanks for your point, makes sense for me either. Do you want to have those settings available in the Report settings -> parameters section? Is this what you are referring to? king202 wrote: -Guest monitoring, again I cannot select just one or two. it lists ALL of them. when I run the report it lists all my VM Guests on that host. create a report that would allow the end user to select just the VM's he wants in his report. Well yes, you can select VMs that are located on the specified host and even group those VMs. But would that be a little messy if you need to select 1 or 2 VMs from a huge list? Probably "Search" option might do the trick, but not sure we will ship this functionality in our next release. king202 wrote: -Under Reporting Jobs in the configuration Tab. ADmins sometimes like to get Monthley reports, you only have an option to run hourly reports or daily reports. it would be nice to see and option to have this run on a monthly level or both. Thanks for pointing this out. I think it won't be hard to add this option. On top of that, what about the Reporter Dashboard? Could you please share what reports (if any) you have placed there? Vitaliy S. wrote: Could you please clarify if you would like to see the highest spike for month or week in this report? What time period do you usually use? I am asking this because all past performance data is aggregated before it gets into the database, so right now you are already getting a somewhat average number. But thanks for your point, makes sense for me either. When you create a veem report, the information is already in the veeam reports, when you move the mouse over the line it does display a number. Vitaliy S. wrote: Do you want to have those settings available in the Report settings -> parameters section? Is this what you are referring to? Thats correct, Some options under Report Settings would be nice. i am aware you can create custom views with the widgets but that is of the overall view. Jesse, thanks for sharing this info, much appreciated. When do you think will be the next scheduled release of veeam reporter? We are working actively on the next version, but I can not disclose any dates right now. Stay tuned for updates from Veeam team on these forums. Yes, ESX/ESXi 4.1 is fully supported.